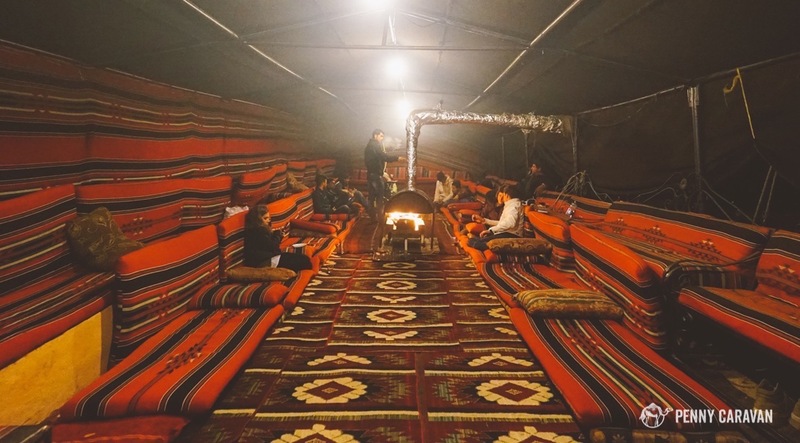 When you’re out in the Jordanian desert, why not stay like the local tribes have been doing for ages–in a tent! This was an experience I was very looking forward to on our trip, so we planned on it twice, here in Petra and also at Wadi Rum. 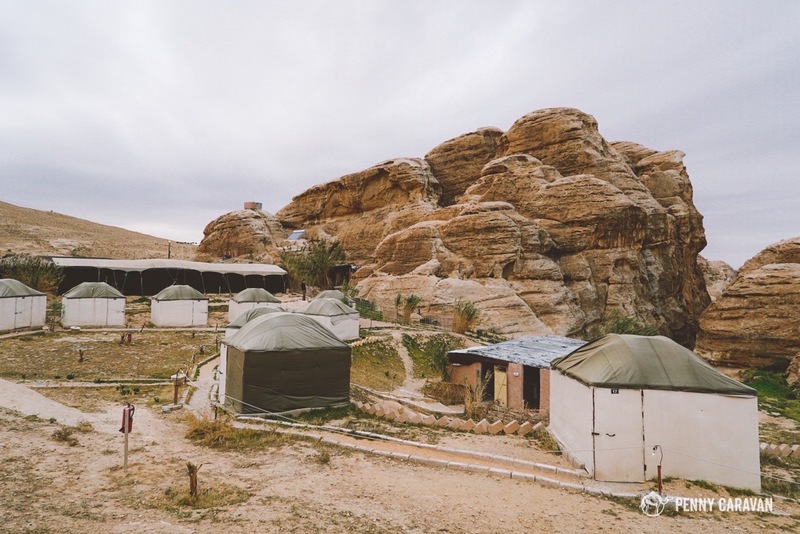 Since our Wadi Rum camp was going to be a luxury experience, we looked for basic but beautiful accommodations at Petra and easily settled on Seven Wonders. The tents all arranged in a large circle. 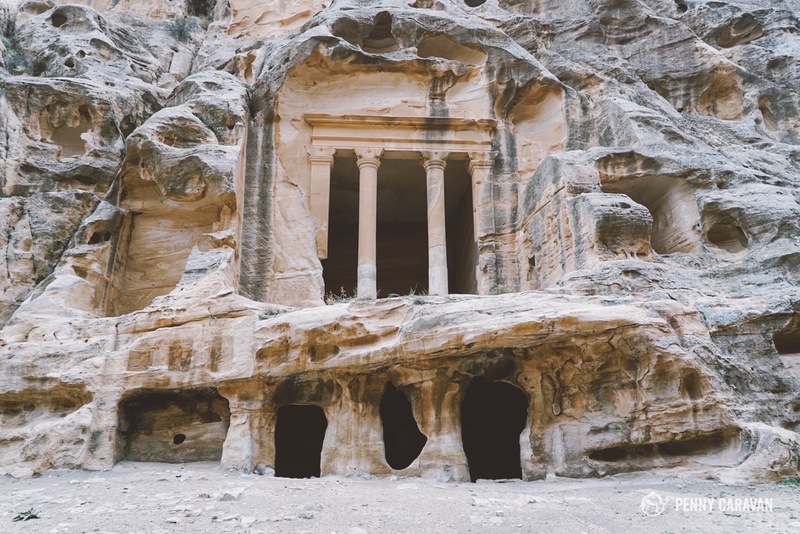 Location: Seven Wonders is located very near Little Petra, the miniature Nabatean city that is about 8km north of Wadi Musa. 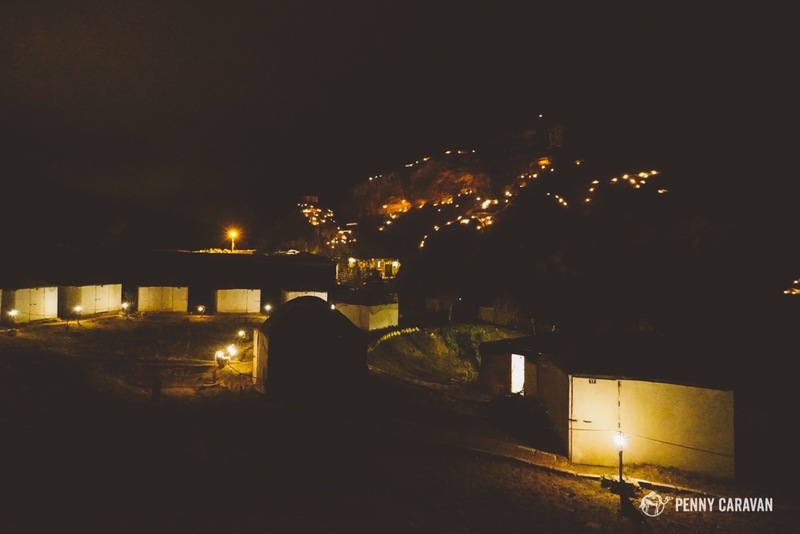 The camp is situated near a canyon wall that is romantically lit at night with dozens of lamps. 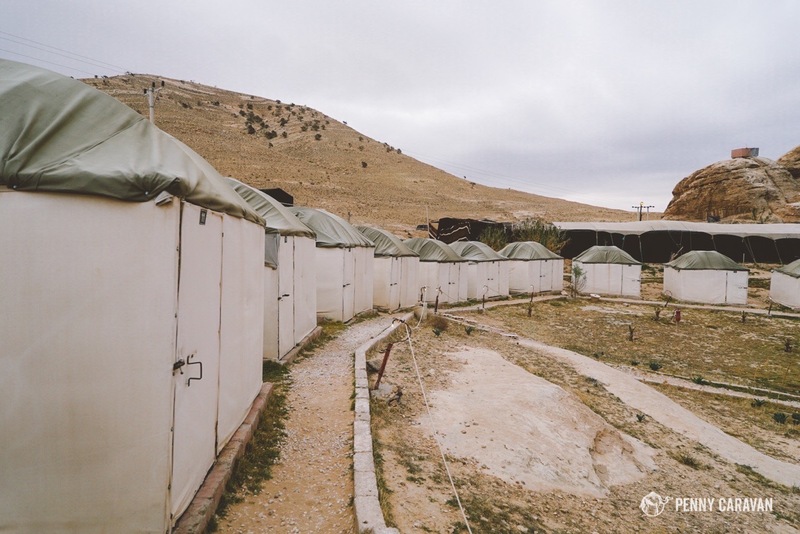 Though it is a little bit of a drive from Wadi Musa, the road does take you through Umm Sayhoun, the housing village that was built by the government in the 1980s to relocate the bedouin tribes who were living in Petra, so you get to see a little slice of their new life as you drive through. Taxis can take you from Wadi Musa to the camp, but they may drop you at the end of the drive if the road is in poor condition. 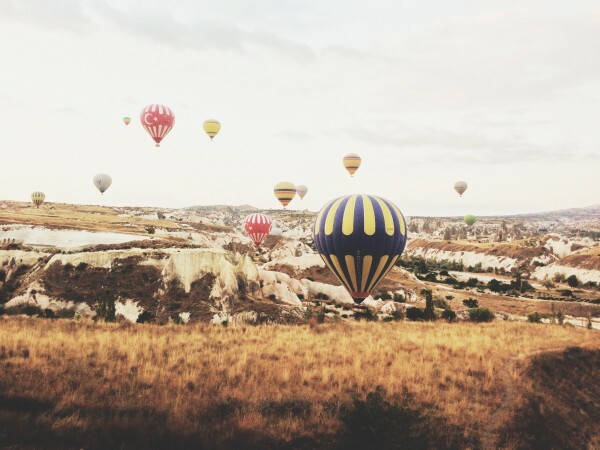 For this reason, it’s recommended to use Seven Wonders’ own shuttle service using four wheel drive trucks. There is always someone available to shuttle you into town (Wadi Musa) or to the Petra Visitor’s Center for 5JD each way. 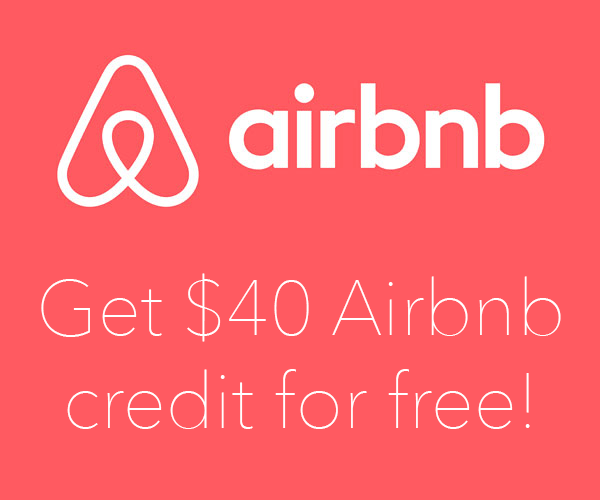 The price is per vehicle, not per person, so you can split the cost with others. The camp is located a short drive from Little Petra. The incredible night sky at the camp. Room: The tents are situated in a circle around the shower house, and are numbered so you don’t forget which one is yours! 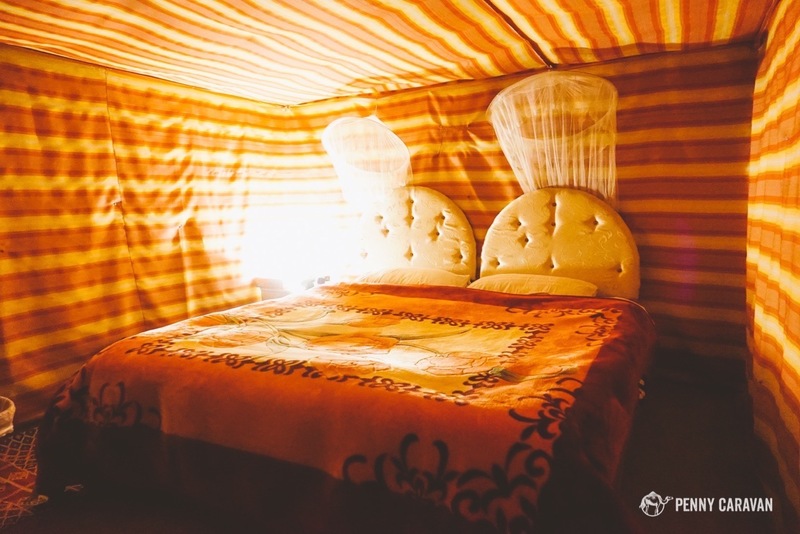 Each tent is set on a concrete slab, and uses very thick vinyl as the walls and ceilings. 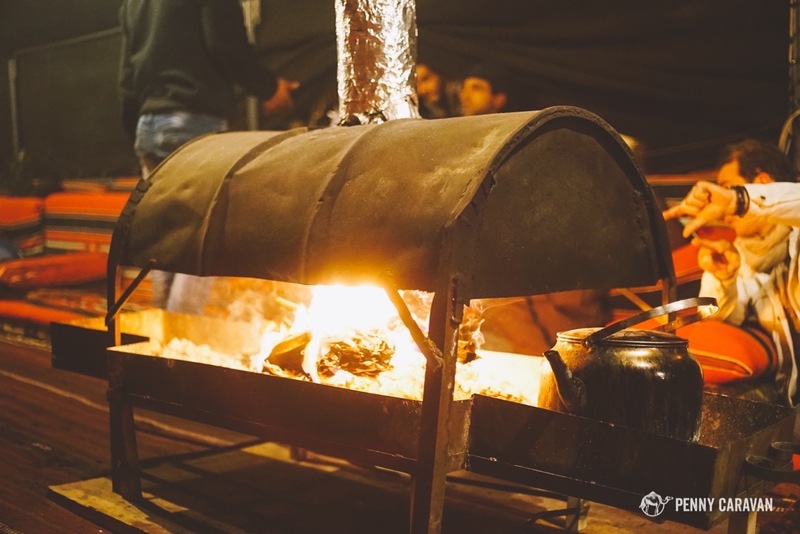 There is no air conditioning or heat, but the tents are insulated so well that we hardly felt cold even in the freezing rain of winter. Our tent had a king size bed with multiple blankets, a comfortable mattress, a single lightbulb on the side table, and candles for when the electricity turns off (11pm sharp, so be sure to charge your phones by then). The doors don’t lock, so you may worry if you have valuables in your luggage. My advice would be to not take valuables with you at all unless they are going with you everywhere. Phone, camera, passport should be with you at all times. The shower house has multiple shower stalls and toilets, separated by gender of course. I’m not sure how many others were staying at the camp when we were, but there was hardly ever anyone else in the shower house. The water was nice and hot and the pressure was pretty good. There are three long tents at the entrance that make up the kitchen and dining tents. 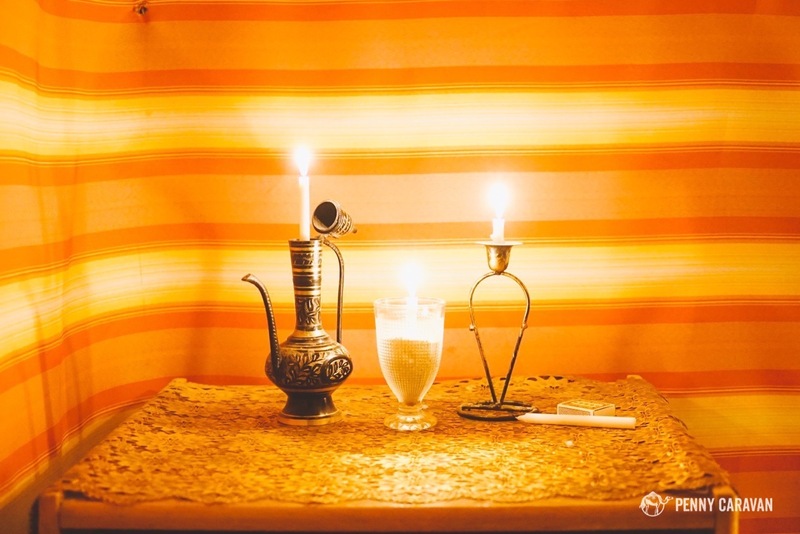 One tent had a fire pit in the middle and served as the after-dinner congregating area where tea was served, accompanied by great music and shisha. Candles provided for use after the electricity gets shut off at 11pm. The camp on a cloudy winter day. Same view at night, when the hill is lit up. Meals: Breakfast and dinner are served on site, but are not included in the price of your room. Just let Atef know if you plan to be there for dinner so they can prepare for the right number of people. Dinner was Maklubah, a traditional chicken and rice dish with tons of vegetables that’s served family-style on one giant tray. 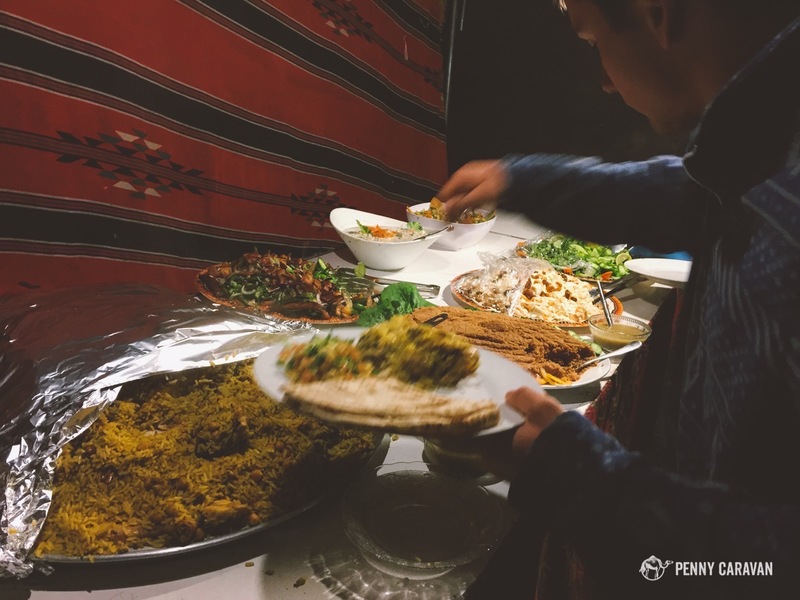 Bread and mezzes were also in abundance, and delicious bedouin tea was served after dinner. Breakfast was plenty hearty, just not as memorable. I’m sure there was hot tea and instant coffee, bread with yogurt and honey, boiled eggs, and probably a cucumber salad. 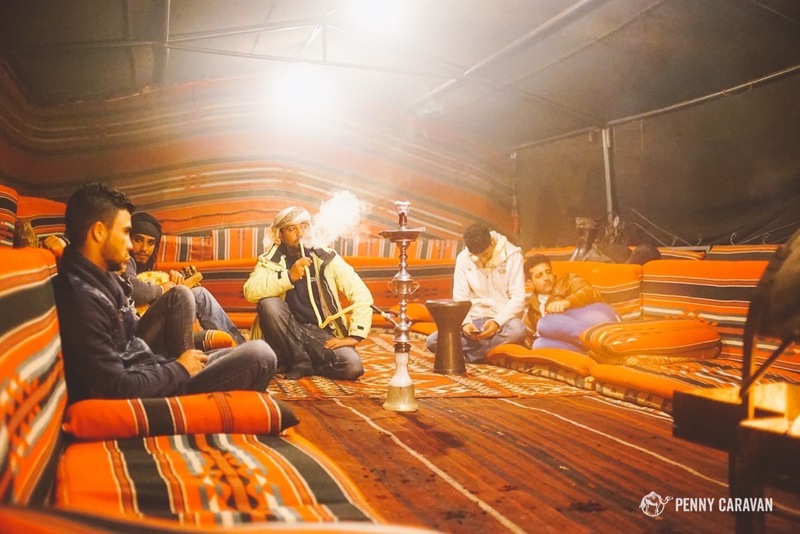 The communal tent for after dinner tea and shisha. Staff: Atef runs the camp with a small army of young bedouin men. We jokingly called them Atef and the Lost Boys because there seemed to be so many of them and they all just wanted to hang out, smoke and drive their trucks around the desert! Don’t expect a check-in desk or anything similar. We had to hunt down Atef as we were leaving to tell him we needed to pay for our room, and he pulled a scrap piece of paper out of the pocket of his sweatpants where he was apparently keeping notes on who owed what. No one seemed to be very organized, but the plethora of young men hanging around meant it was pretty easy to find someone to help when we had any questions or were ready for a ride into town. Jane, on the other hand, was very professional. 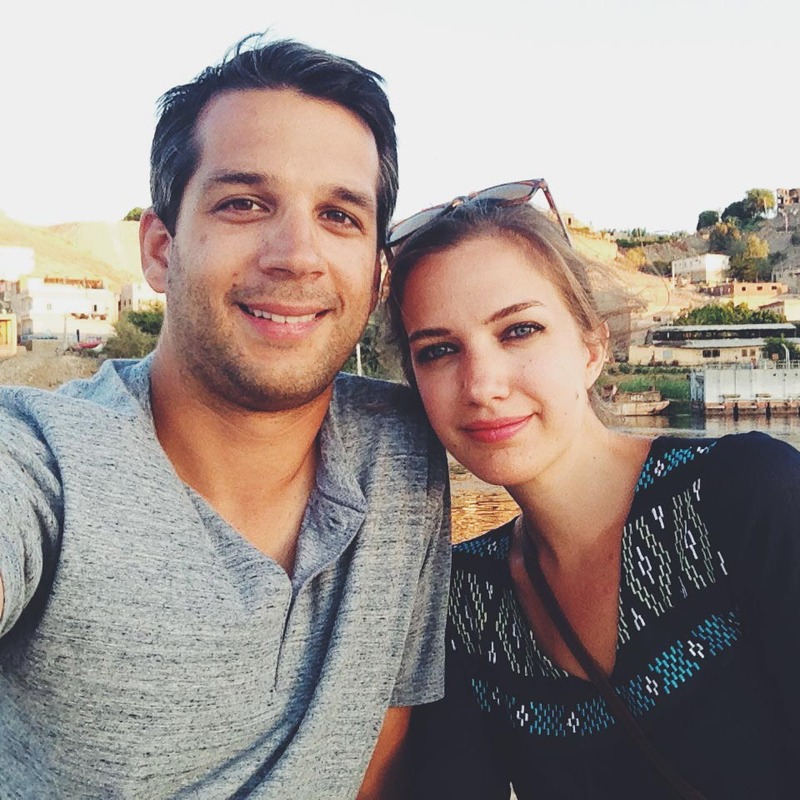 She handled our booking and emailed us information about the area in advance. When we arrived at Wadi Musa, we were able to have breakfast at their sister property, a hotel in town called Rocky Mountain Hotel, which she apparently runs while she has Atef run the camp. She allowed us to leave our bags there so we could enjoy the full day at Petra before even going to the camp. That morning at breakfast, she gave us information to help plan our day and the Petra by Night tour, and she had someone waiting for us with our bags when the tour was over to take us to the camp that night. The eating area at Rocky Mountain Hotel where we had breakfast. In conclusion: Camping in the desert may have been one of the things I was most looking forward to on our trip. 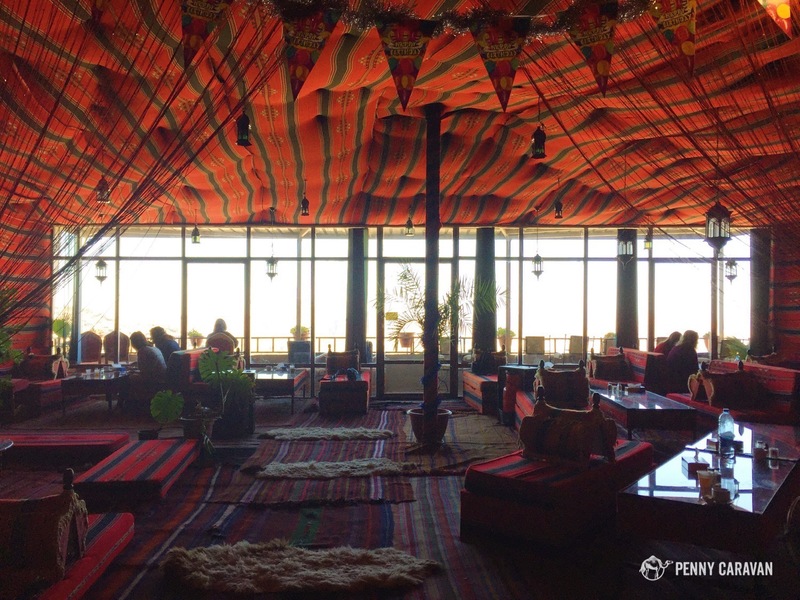 After “roughing” it at the camp here at Petra, we also stayed at a luxury camp in Wadi Rum, and I’m glad that we experienced both ends of the spectrum. 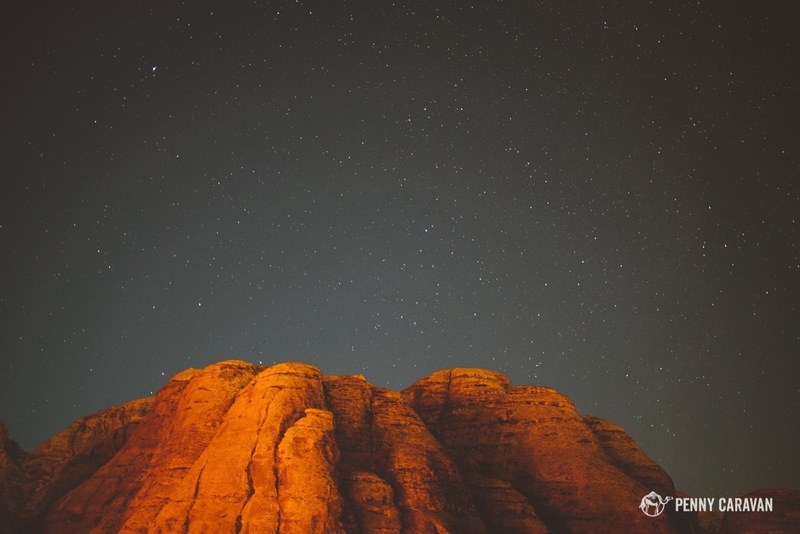 There’s no better way to get the full experience of Petra than to end your day of sightseeing looking up at the night sky with a cup of cinnamon tea before crawling into a cozy bedouin tent!